Here is our monthly summary of RV recalls for February 2018 and related equipment we feel are of interest to our readers. This information has been gleaned from the U.S. National Highway Transportation Safety Administration. This is NOT a complete list of all vehicles and related equipment recalled. More than 900 RVtravel.com readers have signed up for our new RV TRAVEL group at RVillage. If you have not joined RVillage and our RV Travel group there you are missing out. One of the great things about RVillage is you can, if you wish, learn if RVers with common interests are in your area or even your campground. What a great way to meet fellow RVers! Click to learn the details. DRV Suites (DRV) is recalling certain 2014-2015 Tradition, 2014-2016 Full House, 2006-2016 Elite Suites, and 2013-2016 Estates fifth wheel travel trailers. The affected vehicles have front side reflex reflectors located above the maximum height of 60″. As such, these vehicles fail to comply with the requirements of Federal Motor Vehicle Safety Standard (FMVSS) number 108, “Lamps, Reflective Devices, and Associated Equipment.” If the reflector is located outside of the required area, it can reduce the visibility of the vehicle by other drivers, increasing the risk of a crash. DRV has notified owners and will provide a new reflector to install in the correct location, free of charge. The recall began July 21, 2017. Owners may contact DRV customer service at 1-260-562-3500. 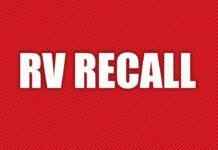 DRV’s number for this recall is 99.02.05. Eclipse Recreational Vehicles, Inc. (Eclipse) is recalling certain 2019 Attitude recreational trailers. These vehicles were equipped with tires that have the incorrect load range. The incorrect tires may be overloaded, possibly resulting in tire failure and increasing the risk of a crash. Eclipse will notify owners, and dealers will install tires of the correct load rating, free of charge. Owners may contact Eclipse customer service at 1-951-684-6868. Entegra Coach (Entegra) is recalling certain 2015-2016 Aspire and 2017-2018 Insignia motorhomes built on a Spartan chassis. The air brake supply reservoir is less than 12x the combined volume of air for all service brake chambers. As such, these vehicles fail to comply with the requirements of Federal Motor Vehicle Safety Standard (FMVSS) number 121, “Air Brake Systems.” The undersized air brake supply reservoir may provide an insufficient air supply to properly operate the brakes during repetitive brake applications, reducing braking performance and increasing the risk of a crash. Entegra will notify owners, and Spartan service centers will replace the current air supply reservoir with one that has twice the capacity, free of charge. The recall began on February 16, 2018. Owners may contact Spartan Chassis at 1-800-543-4277 or Entegra customer service at 1-800-517-9137. Forest River, Inc. (Forest River) is recalling certain 2018 Cardinal recreational trailers, models CAF3045RLLE, CAF304SR, CAF322DS and CAF392RD. These vehicles were manufactured without an emergency exit window in the rear wall of the vehicle. Without a secondary means of escape from the vehicle, a person may be trapped inside the vehicle during an emergency, which could increase the risk of injury. Forest River will notify owners, and dealers will install an emergency exit window, free of charge. The recall began on February 14, 2018. Owners may contact Forest River customer service at 1-574-206-7600. Forest River’s number for this recall is 15-0626. Forest River, Inc. (Forest River) is recalling certain 2018 Cherokee recreational trailers. The amber side marker lights are not located as far to the front as feasible on the vehicle. Additionally, the vehicles may also be missing the intermediate side reflex reflectors located at, or near, the midpoint of the vehicle. As such, these vehicles fail to comply with the requirements of Federal Motor Vehicle Safety Standard (FMVSS) number 108, “Lamps, Reflective Devices, and Associated Equipment.” If the marker lights are in the wrong location or if the reflectors are missing, it can reduce the visibility of the vehicle to other drivers, increasing the risk of a crash. Forest River will notify owners, and dealers will install amber side marker lights as far forward as feasible, and mount side marker reflectors, free of charge. The recall began on February 16, 2018. Owners may contact Forest River customer service at 1-260-499-2100. Forest River’s number for this recall is 75-0613. Forest River, Inc. (Forest River) is recalling certain 2018 Georgetown recreational vehicles, models GTA36D7 and GTA34P7. These vehicles have 18 gauge wires connected to a 30 amp circuit breaker. 18 gauge wires cannot handle the potential amp draw, possibly resulting in the wires melting and increasing the risk of a fire. Forest River will notify owners, and dealers will connect the 18 gauge wiring to an additional circuit breaker that will be installed, free of charge. The recall began on February 20, 2018. Owners may contact Forest River customer service at 1-574-206-7600. Forest River’s number for this recall is 68-0623. Forest River, Inc. (Forest River) is recalling certain 2018 Palomino PaloMini recreational trailers. The mounting bracket for the single liquid propane (LP) bottle may break allowing the LP bottle to detach from the vehicle. If the LP bottle detaches from the vehicle, there is an increased risk of injury or crash. Forest River will notify owners, and dealers will install a new LP bottle ring, free of charge. The recall is expected to begin March 22, 2018. Owners may contact Forest River customer service at 1-269-432-3246. Forest River’s number for this recall is 400-0612. Forest River, Inc. (Forest River) is recalling certain 2018 Rockwood and Flagstaff, and Coachmen Freedom Express recreational trailers, and 2017-2018 Palomino and XLR ToyHauler and Coachmen Viking recreational trailers equipped with a Smart-Jack model power tongue jack. The laminated plastic touch pad on the jack may crack or separate allowing water to enter, potentially causing the jack to operate unintentionally. If the tongue jack retracts or extends unexpectedly, there could be an increased risk of a crash or injury. Forest River will notify owners, and a Forest River or a Lippert dealer will replace the power tongue jack, free of charge. The recall began on February 20, 2018. Rockwood and Flagstaff Owners may contact Forest River customer service at 1-574-642-5164; XLR ToyHauler owners can call 1-574-642-0432; Viking owners can call 1-269-467-4600; Freedom Express owners can call 1-574-825-8205; Palomino owners can call 1-269-432-3246. Lippert Customer service can be reached at 1-574-538-4514 or by email at recall@lci1.com. Forest River’s number for this recall is 51-0610. Foretravel, Inc. (Foretravel) is recalling certain 2004-2019 U270, U295, U320, Nimbus, Phenix, Realm, and ih-45 motorhomes. These vehicles are equipped with Kidde Plastic-Handle or Push Button ‘Pindicator’ Fire Extinguishers that may become clogged, preventing the extinguisher from discharging as expected or requiring excessive force to activate the extinguisher. Additionally, in certain models, the nozzle may detach from the valve assembly with enough force that it could cause injury and also render the product inoperable. For a full list of the affected fire extinguisher models click here. In the event of a fire, if the fire extinguisher does not function properly, it can increase the risk of injury. Foretravel will notify owners and instruct them to contact Kidde for a replacement fire extinguisher, free of charge. The recall began on February 6, 2018. Owners may contact Foretravel customer service at 1-936-564-8367, or Kidde customer service toll free at 1-855-262-3540, or online at www.kidde.com and click on “Product Safety Recall” for more information. Gulf Stream Coach, Inc. (Gulf Stream) is recalling certain 2018 Geo and Matrix recreational trailers. The Federal Certification Labels on these vehicles may incorrectly list the Kilogram (Kg) weight rating of the rear axle as 182 Kg (401.31 lbs.) below its actual capacity. As such, these vehicles fail to comply with the requirements of 49 CFR Part 567, “Certification.” The axle information for the front axle is correctly listed as 4400 lbs./1996kg, but the rear axle information is incorrectly listed as 4400lbs./1814kg. The discrepancy in information may cause the owner confusion. Gulf Stream will notify owners, and will provide corrected labels, free of charge. The recall was expected to begin February 28, 2018. Owners may contact Gulf Stream customer service at 1-800-289-8787. Highland Ridge RV (Highland Ridge) is recalling certain 2018 Open Range light travel trailers, model 312BHS. The Federal Label on these vehicles incorrectly lists the Gross Axle Weight Rating (GAWR) as 5100 lbs. when the correct GAWR is 4400 lbs. As such, these vehicles fail to comply with the requirements of Federal Motor Vehicle Safety Standard (FMVSS) number 110, “Tire Selection and Rims.” The incorrect GAWR information may result in the trailer being overloaded which can cause the tires to wear prematurely, increasing the risk of a crash. Highland Ridge will notify owners, and dealers will replace the incorrect Federal Label with a corrected label, free of charge. The recall began on February 7, 2018. Owners may contact Highland Ridge customer service at 1-260-768-7771. Highland’s number for this recall is 9904374. Jayco, Inc. (Jayco) is recalling certain 2017 Precept motorhomes. The brake Hydraulic Electronic Control Units (HECU) on these vehicles may be missing valve block ball plugs, potentially causing a brake fluid leak or air ingestion during electronic brake distribution and/or ABS activation. A brake fluid leak or air ingestion can lengthen the distance needed to stop the vehicle, increasing the risk of a crash. Jayco will notify owners, and Ford dealers will inspect the hydraulic block and replace the HECU if the ball plugs are present, free of charge. The recall began on February 16, 2018. Owners may contact Jayco customer service at 1-800-517-9137. Jayco, Inc. (Jayco) is recalling certain 2017, 2018 Eagle 333BHOK (EC) travel trailers. The safety chains on these vehicles are rated at 11,700 lbs., however the Gross Vehicle Weight Rating (GVWR) is 12,500 lbs. In the event of a trailer detachment, the underrated safety chains may fail. If the safety chains fail in the event of a detachment, the trailer would separate from the tow vehicle, increasing the risk of a crash. Jayco will notify owners, and dealers will install safety chains that have a GVWR of 16,200 lbs., free of charge. The recall began on February 8, 2018. Owners may contact Jayco customer service at 1-800-283-8267. Jayco’s number for this recall is 9901372. Jayco, Inc. (Jayco) is recalling certain 2018 Eagle EA, EB, ED travel trailers. The Federal Labels and Cargo Carrying Capacity (CCC) label on these vehicles may incorrectly list the Gross Vehicle Weight Rating (GVWR) as 11,750 lbs., when the actual GVWR is 11,700 lbs. As such, these vehicles fail to comply with the requirements of Federal Motor Vehicle Safety Standard (FMVSS) number 110, “Tire Selection and Rims.” If the GVWR is incorrect it can allow the vehicle to be overloaded, increasing the risk of a crash. Jayco will notify owners and provide them with a corrected label, free of charge. The recall began on February 13, 2018. Owners may contact Jayco customer service at 1-800-283-8267. Jayco’s number for this recall is 9901373. Jayco, Inc. (Jayco) is recalling certain 2018 Eagle travel trailers, model 333BHOK. The flame on the Furrion cook top can become inverted or go out when the furnace is turned on; however, liquid propane (LP) gas will continue to flow to the burners. LP gas flow to an unlit stove burner may result in an explosion, increasing the risk of injury. Jayco will notify owners, and dealers will install two wood panels to prevent air from the furnace affecting the stove burners, free of charge. The recall began on February 14, 2018. Owners may contact Jayco customer service at 1-800-283-8267. Jayco’s number for this recall is 9901366. Keystone RV Company (Keystone) is recalling certain 2018 Crossroads Sunset trailers. These trailers may have Sterling Sport tires that are rated for 1760 lbs. instead of tires that are rated for 2040 lbs. as intended. The incorrect tires may be overloaded, possibly resulting in tire failure, increasing the risk of a crash. Keystone will notify owners, and dealers will replace the tires with the correct load rated tires, free of charge. The recall is expected to begin March 30, 2018. Owners may contact Keystone customer service at 1-866-425-4369. Keystone’s number for this recall is 18-313. KZRV, L.P. (KZRV) is recalling certain 2017-2018 Durango Gold recreational trailers. The rear sofa in these vehicles may limit visibility of the rear exit window label and/or the sofa cushion may restrict access to, and operation of, the exit window handle. If the sofa delays using the exit window in the event of an emergency, the occupants have an increased risk of injury. KZRV will notify owners, and dealers will replace the sofa back with a back that isn’t as tall, free of charge. The recall is expected to begin March 16, 2018. Owners may contact KZRV customer service at 1-800-768-4016 extension 154 or 153. KZRV’s number for this recall is KZ-2018-01. Lance Camper Manufacturing Corp. (Lance) is recalling certain 2018 recreational trailers, models 1475, 1575, 1685, 1995, 2185, 2285, 2295, 2375 and 2465, equipped with a Smart-Jack model power tongue jack. The laminated plastic touch pad on the jack may crack or separate allowing water to enter, potentially causing the jack to operate unintentionally. If the jack retracts or extends unintentionally, it can increase the risk of injury to those within the trailer or increase the risk of a crash if the jack moves while the trailer is being towed. Lance will notify owners, and dealers will replace the power tongue jack, free of charge. The recall was expected to begin February 26, 2018. Owners may contact Lance customer service at 1-661-949-3322. Lance Camper Manufacturing Corp. (Lance) is recalling certain 2018 travel trailers, models 1985, 1995, 2185, 2155, 2295, and 2375. The battery on these vehicles may move within its compartment while the vehicle is in motion, causing the door to open and allowing the battery to fall out. If the battery falls out of the compartment while the trailer is being towed, it may become a road hazard, increasing the risk of a crash. Lance will notify owners, and dealers will install a retrofit strap kit to keep the battery from moving, free of charge. The recall was expected to begin February 15, 2018. Owners may contact Lance customer service at 1-661-949-3322. Liberty Outdoors, LLC (Liberty) is recalling certain 2018 Little Guy Max recreational trailers, equipped with a Smart-Jack model power tongue jack. The laminated plastic touch pad on the jack may crack or separate allowing water to enter, potentially causing the jack to operate unintentionally. If the jack retracts or extends unintentionally, it can increase the risk of injury to those within the trailer or increase the risk of a crash if the jack moves while the trailer is being towed. Liberty will notify owners, and dealers will replace the power tongue jack, free of charge. The recall began on February 27, 2018. Owners may contact Liberty customer service at 1-877-545-4897. Liberty’s number for this recall is LOR-001. Newmar Corporation (Newmar) is recalling certain 2017-2018 Ventana, Ventana LE and Dutchstar motorhomes built on a Freightliner chassis. The low beam headlights do not also illuminate as intended when the high beam headlights are activated, reducing the driver’s visibility. As such, these vehicles fail to comply with the requirements of Federal Motor Vehicle Safety Standard (FMVSS) number 108, “Lamps, Reflective Devices, and Associated Equipment.” If the driver has reduced visibility, there would be an increased risk of a crash. Newmar will notify owners, and Daimler Trucks North America authorized service facilities will reprogram the Freightliner chassis module, free of charge. The recall began on February 9, 2018. Owners may contact Newmar customer service at 1-800-731-8300. Newmar Corporation (Newmar) is recalling certain 2018 Essex motorhomes built on a Freightliner chassis. The low beam headlights do not also illuminate as intended when the high beam headlights are activated, reducing the driver’s visibility. As such, these vehicles fail to comply with the requirements of Federal Motor Vehicle Safety Standard (FMVSS) number 108, “Lamps, Reflective Devices, and Associated Equipment.” If the driver has reduced visibility, there would be an increased risk of a crash. Newmar will notify owners, and Daimler Trucks North America authorized service facilities will reprogram the Freightliner chassis module, free of charge. The recall began on February 9, 2018. Owners may contact Newmar customer service at 1-800-731-8300. Triple E Recreational Vehicles (Triple E) is recalling certain 2002-2009 Invitation and Embassy recreational vehicles, 2002-2012 Regency, Regal, Senator and Topaz recreational vehicles, 2002-2010 Signature, Commander and Empress recreational vehicles, 2005-2013 Regency GT recreational vehicles, 2011-2013 MOT Trailers, 2012 Roughneck trailers (NT300), 2008-2013 Free Flight, Serenity (S24CB), Liberio (L24CB) and Free Spirit recreational vehicles and 2010-2013 Unity recreational vehicles. These motorhomes are equipped with Kidde Plastic-Handle or Push Button ‘Pindicator’ Fire Extinguishers that may become clogged, preventing the extinguisher from discharging as expected or requiring excessive force to activate the extinguisher. Additionally, in certain models, the nozzle may detach from the valve assembly with enough force that it could cause injury and also render the product inoperable. In the event of a fire, if the fire extinguisher does not function properly, it can increase the risk of injury.For a full list of the affected fire extinguisher models click here. Triple E will notify owners, instructing them to contact Kidde for a replacement fire extinguisher, free of charge. The recall is expected to begin February 26, 2018. Owners may contact Kidde customer service at 1-855-262-3540 or online at www.kidde.com and click on “Product Safety Recall” for more information. Triple E’s number for this recall is CA#8894-1. RV Travel contributor Mike Sokol is America’s leading expert on RV electricity. Mike has taken his 40+ years of experience to write this book about RV electricity that nearly anyone can understand. Covers the basics of Voltage, Amperage, Wattage and Grounding, with additional chapters on RV Hot-Skin testing, GFCI operation, portable generator hookups and troubleshooting RV electrical systems. This should be essential reading for all RVers. Learn more or order. Read the most recent issue of Mike Sokol’s new monthly RV Electricity Newsletter. It’s full of important, and potentially lifesaving information. If you have not signed up for an email alert for new issues, please do so today so you don’t miss out. DO YOU HAVE A NORCOLD REFRIGERATOR? If so, watch this important video about a critical recall. A class action lawsuit has been settled. Click on this page for the settlement website and a link to the court ruling. Chrysler (FCA US LLC) is recalling certain 2017 Dodge Caravan and Jeep Wrangler vehicles. The brake switches on these vehicles may malfunction, keeping the brake lights illuminated and/or allowing the vehicle to be shifted out of the PARK position without the brake pedal being pushed. Having the brake lamps continuously illuminated or being able to shift the vehicle out of PARK when the brake pedal is not pressed (and the ignition is in the RUN mode) can increase the risk of a crash. Chrysler will notify owners, and dealers will replace the brake switches, free of charge. The recall is expected to begin March 30, 2018. Owners may contact Chrysler customer service at 1-800-853-1403. Chrysler’s number for this recall is U09. Chrysler (FCA US LLC) is recalling certain 2017-2018 RAM 1500, 2500, 3500, 3500 Cab Chassis, 4500 Cab Chassis, and 5500 Cab Chassis vehicles, all equipped with a column shifter. Pushing the brake pedal for prolonged periods when the vehicle is running and in PARK may cause the Brake Transmission Shift Interlock (BTSI) pin to stick in the open position. With the pin in the open position, the transmission can be shifted out of PARK into any gear without pushing the brake pedal or having the key in the ignition. Being able to shift the transmission without pushing the brake pedal and/or without a key in the ignition can increase the risk of an unintended vehicle rollaway that may result in personal injury or a crash. Chrysler will notify owners and dealers will update the Body Control Module software. Dealers will also test the BTSI operation, replacing the solenoid as necessary. The recall began February 28, 2018. Owners may contact Chrysler customer service at 1-800-853-1403. Chrysler’s number for this recall is U11. Ford Motor Company (Ford) is recalling certain 2006 Ford Ranger trucks. Ford is requesting owners NOT TO DRIVE these vehicles until they have been repaired. In the event of a crash necessitating deployment of the driver’s frontal air bag, the inflator could explode with sharp metal fragments striking the vehicle occupants, potentially resulting in serious injury or death. Upon deployment of the passenger side frontal air bag, excessive internal pressure may cause the inflator to explode. On January 11, 2018, Ford Motor Company (Ford) notified NHTSA that they are recalling 2,700 model year 2006 Ranger vehicles built with driver-side and passenger-side air bag inflators. As of February 9, 2018, Ford is expanding the recall to a total of 33,310 model year 2006 Ranger vehicles. Upon deployment of the driver side or passenger side frontal air bag, excessive internal pressure may cause the inflator to explode. Ford will notify owners instructing them to not drive their vehicles, and dealers will replace the front driver side air bag inflator and passenger side air bag inflator with an alternate inflator, free of charge. The recall for the original population began on January 16, 2018. Owners within the expanded population were to be notified beginning in the week of February 12, 2018. Owners may contact Ford customer service at 1-866-436-7332. Ford’s number for this recall is 18S02. Ford Motor Company (Ford) is recalling certain 2018 Ford Escape and Lincoln MKC vehicles. These vehicles may be equipped with incorrect front brake hoses that may chafe against other components, possibly resulting in a brake fluid leak. A brake fluid leak may lengthen the distance needed to stop the vehicle, increasing the risk of a crash. Ford will notify owners, and dealers will inspect the brake hoses, replacing any that are incorrect, free of charge. The recall is expected to begin March 5, 2018. Owners may contact Ford customer service at 1-866-436-7332. Ford’s number for this recall is 18S04. Hyundai Motor America (Hyundai) is recalling certain 2018 Hyundai Santa Fe and Santa Fe Sport vehicles. The steering wheel assembly may break, possibly resulting in the steering wheel separating from the steering column while driving. A steering wheel separation while driving can cause a loss of vehicle control and increase the risk of a crash. Hyundai will notify owners, and dealers will check the production lot number of the steering wheel assembly, replacing it as necessary, free of charge. The recall is expected to begin March 16, 2018. Owners may contact Hyundai customer service at 1-855-371-9460. Hyundai’s number for this recall is 173. Jaguar Land Rover North America, LLC (Land Rover) is recalling certain 2018 Land Rover Range Rover Evoque, Range Rover Velar, and Land Rover Discover Sport vehicles equipped with a 2.0L gasoline engine. The fuel rail end caps may leak, possibly resulting in fuel vapor or liquid fuel leaking into the engine bay. A fuel leak in the presence of an ignition source such as hot engine or exhaust components can increase the risk of a fire. Land Rover will notify owners, and dealers will replace the fuel rail, free of charge. The recall is expected to begin March 23, 2018. Owners may contact Land Rover customer service at 1-800-637-6837. Land Rover’s number for this recall is N138. Mazda is recalling certain 2006 B-series vehicles. Mazda requests owners NOT TO DRIVE these vehicles until they have been remedied. Upon deployment of the driver side frontal air bag, excessive internal pressure may cause the inflator to explode. In the event of a crash necessitating deployment of the driver’s frontal air bag, the inflator could explode with sharp metal fragments striking the vehicle occupants, potentially resulting in serious injury or death. On January 11, 2018, Mazda North American Operations (Mazda) notified NHTSA that they are recalling 160 model year 2006 B-Series vehicles built with driver side air bags. As of February 9, 2018, Mazda is expanding the recall to a total of 2,205 model year 2006 B-Series vehicles built with driver-side air bags. Upon deployment of the driver side frontal air bag, excessive internal pressure may cause the inflator to explode. Mazda will notify owners instructing them to not drive their vehicles, and dealers will replace the front driver side air bag inflator with an alternate inflator, free of charge. The recall for the original population began on January 16, 2018. Owners may contact Mazda customer service at 1-800-222-5500. Mazda’s number for this recall is 2218A. Mazda North America Operations (Mazda) is recalling certain 2006 B-Series vehicles. Mazda is requesting owners to NOT DRIVE these vehicles until they have been remedied. Upon deployment of the passenger side frontal air bag, excessive internal pressure may cause the inflator to explode. In the event of a crash necessitating deployment of the passenger’s frontal air bag, the inflator could explode with sharp metal fragments striking the vehicle occupants, potentially resulting in serious injury or death. Mazda will notify owners instructing them to not drive their vehicles, and dealers will replace the front passenger side air bag inflator with an alternate inflator, free of charge. The recall for the original population began on January 16, 2018. Owners may contact Mazda customer service at 1-800-222-5500. Mazda’s number for this recall is 2318A. Mitsubishi Motors North America, Inc. (MMNA) is recalling certain 2007-2010 Outlander, 2008-2010 Lancer, 2009-2010 Lancer Evolution, and 2010 Lancer Sportback vehicles equipped with sunroofs. The sunroof glass may detach from the sunroof assembly, becoming a road hazard to other vehicles. If the sunroof glass detaches from the assembly while driving, it can become a road hazard, increasing the risk of a crash. MMNA will notify owners, and dealers will replace the sunroof glass assembly, free of charge. The recall began on February 27, 2018. Owners may contact MMNA customer service at 1-888-648-7820. MMNA’s number for this recall is SR-18-003. Mitsubishi Motors North America, Inc. (MMNA) is recalling certain 2014-2016 Outlander and 2013-2016 Outlander Sport vehicles. Water may enter the rear brake calipers causing the parking brake actuator shafts to corrode and possibly bind. If the parking brake actuator shaft binds, the parking brake may not engage or disengage fully. If the parking brake does not engage properly, the vehicle may move unexpectedly if it is parked on a slope, increasing the risk of a crash. MMNA will notify owners, and dealers will inspect the rear brake calipers and replace the parking brake boot and lever or the brake caliper body, as necessary. Dealers will also replace the piston assembly of the rear brake caliper. These repairs will be performed free of charge. The recall is expected to begin March 27, 2018. Owners may contact MMNA customer service at 1-888-648-7820. MMNA’s number for this recall is SR-18-002. Mitsubishi Motors North America, Inc. (MMNA) is recalling certain 2009-2012 Lancer, 2008-2012 Outlander, 2010-2012 Lancer Sportback, and 2011-2012 Outlander Sport vehicles equipped with either a 4B11 or 4B12 engine. The drive belt automatic tensioner flange may crack, allowing the accessory drive belt to detach. If the drive belt detaches, the battery will discharge and the engine will stall, increasing the risk of a crash. MMNA will notify owners, and dealers will replace the belt tensioner with one that has an improved shape, free of charge. The recall is expected to begin March 27, 2018. Owners may contact MMNA customer service at 1-888-648-7820. MMNA’s number for this recall is SR-18-001. Mitsubishi Motors North America, Inc. (MMNA) is recalling certain 2011-2016 Outlander Sport vehicles. Water may enter between the hood and windshield and cause the front wiper link ball joint to corrode, possibly resulting in the wiper link separating and the wipers becoming inoperative. Loss of wiper function can reduce visibility and increase the risk of a crash. MMNA will notify owners, and dealers will replace the rod of the wiper link and the wiper motor crank arm, free of charge. The recall is expected to begin April 10, 2018. Owners may contact MMNA customer service at 1-888-648-7820. MMNA’s number for this recall is SR-18-004. Toyota Motor Engineering & Manufacturing (Toyota) notified NHTSA on January 9, 2018, that they are recalling 14,585 model year 2010-2012 Yaris vehicles ever registered in the states of Alaska, Arizona, Arkansas, Colorado, Connecticut, Delaware, District of Columbia, Idaho, Illinois, Indiana, Iowa, Kansas, Kentucky, Maine, Maryland, Massachusetts, Michigan, Minnesota, Missouri, Montana, Nebraska, Nevada, New Hampshire, New Jersey, New Mexico, New York, North Carolina, North Dakota, Ohio, Oklahoma, Oregon, Pennsylvania, Rhode Island, South Dakota, Tennessee, Utah, Vermont, Virginia, Washington, West Virginia, Wisconsin, and Wyoming. As of January 30, 2018, Toyota is additionally recalling 3,347 model year 2010 Pontiac Vibe vehicles located in states listed above. Also included in this recall filing is 98,194 model year 2003-2008 Toyota Corolla Matrix vehicles, located throughout the U.S., that previously received a “like-for-like” interim air bag inflator replacement. These vehicles are equipped with certain air bag inflators assembled as part of the passenger frontal air bag modules used as original equipment or replacement equipment. In the event of a crash necessitating deployment of the passenger frontal air bag, these inflators may explode due to propellant degradation occurring after long-term exposure to absolute humidity and temperature cycling. An inflator explosion may result in sharp metal fragments striking the driver or other occupants resulting in serious injury or death. Toyota will notify owners, and dealers will replace the passenger frontal air bag assemblies with an alternate inflator, free of charge. The recall began on January 29, 2018. Owners may contact Toyota customer service at 1-800-331-4331. Toyota’s numbers for this recall are G0R “Zone B”, and H0A “Zone C”, J0A “Matrix Zone A”, J0A “Matrix Zone A”, J0A “Matrix Zone A”. Toyota Motor Engineering & Manufacturing (Toyota) is recalling certain 2018 Toyota Tundra and Sequoia vehicles. Electrical interference within the power supply circuit may cause the vehicle’s electronic stability control system to be deactivated. As such, these vehicles fail to comply with the requirements of Federal Motor Vehicle Safety Standard (FMVSS) number 126, “Electronic Stability Control Systems.” Deactivation of the vehicle stability control system can increase the risk of a crash in certain conditions. Toyota will notify owners, and dealers will update the vehicle’s software, free of charge. The recall is expected to begin March 12, 2018. Owners may contact Toyota customer service at 1-888-270-9371. Toyota’s number for this recall is J0H. Vogue Tyre & Rubber Co. (Vogue) is recalling certain Signature V tires, sizes 245/40R20, 235/45R17, 225/50R17, 225/45R17, 235/55R17, 245/45R17 and 235/65R18, and Signature V SCT tires, sizes 285/45R22, 275/55R20. These tires have incomplete Tire Identification number (TIN) codes on the intended outboard sidewalls in that they are missing date codes. As such, these vehicles fail to comply with the requirements of Federal Motor Vehicle Safety Standard (FMVSS) number 139, “New Pneumatic Radial Tires for Light Vehicles.” Missing TIN information can make it difficult for an owner to identify the tire in the event of a recall, potentially increasing the risk of driving with a recalled tire which could result in a crash. Vogue will notify owners, and dealers will replace the affected tires, free of charge. The recall was expected to begin February 12, 2018. Owners may contact Vogue customer service at 1-800-323-1466. Previous articleHow would I set inflation on a smaller single axle trailer? Next articleGet a “bumper crop” from your RV garden!